Amid increasing speculation that Greece will exit the monetary union, it has been confirmed that the country secured its most recent tranche of European bailout funds. As a result, the embattled nation has managed to buy itself some more time. The news triggered a slight rise in the EUR/USD forex market, with the pair ending marginally higher at $1.2935. Nevertheless, the uncertainty over the policies of a new Greek government, as well as how and when it will be formed, still poses a significant downside risk. The forex CFDs market saw the single currency fall below the $1.3000 mark, as Greek politicians failed to agree on a power sharing deal, and that's where we remain this morning. Despite that, it seems Europe remains committed to paying the next instalment of aid, possibly trying to put a floor under the euros slump. Nevertheless, we have seen another downward move for the EUR/USD pair, losing 67 points to $1.2932. At the time of writing we are at $1.2955. The euro remains under pressure, the last few days have seen a political impasse in Greece where leaders failed to form a government. This is fuelling worries of a Greek exit from the euro. However, on the other side of the coin there is also growing speculation that the Federal Reserve will have no choice but to consider QE3 at some point if things turn really ugly in Europe. As a result, the euro lost 55 points against the greenback and fell to $1.3002. However, that could be seen as a mild fall considering we have already dipped below this major support area. The single currency is trading at $1.2985 against the dollar at the time of writing. On the currency markets, the euro is starting to fracture a little at the edges. However, concerns remain that a break up of the periphery might actually increase the value of the euro. After a break up, the weight of Germany would no longer be counteracted by the weaker members and so the single currency could strengthen overall. For the last few years, the effective trading range of the euro/dollar pair has been $1.20-1.46. As a result, the last four months of trading, between the $1.30 and $1.35 levels, puts us pretty much in the middle of the game. If the Eurozone staggers on into the middle distance, building up huge liabilities, then any currency weakness will not be able to accommodate the fiscal burden. The Southern states cannot currently afford to remain in or leave the single currency. However, the North has an even bigger problem in that they are mortgaging their present for an unquantifiable future. For the meantime, support is at $1.3000 and $1.2965/75 and then $1.2865/85. On the upside, resistance is at $1.3068/78 and then above this at $1.3140/50. The longer and medium-term falling trendlines are currently around $1.3250 and will be watched very closely if we do manage a rally. Sterling is currently gaining in all of this, as money moves out of Europe looking for temporarily less volatile regions. The sterling/euro market is now trading at a three year high. However, the €1.2400 region proved to be a high watermark in 2010, and so we have seen some speculative selling from our clients, with stop losses set above €1.2450. The single currency enjoyed a short rally in the morning after the ECB President Mario Draghi said that European policy makers had not discussed a cut in interest rates. The move higher came despite the ECB President also admitting that the European economic outlook had deteriorated. However, forex spread betting investors are remaining cautious because of the political uncertainty in France. The afternoon session ultimately saw the euro close nearly flat at $1.3152. At the time of writing, the EUR/USD pair is at $1.3140, with near term support and resistance at $1.3120/00 and $1.3205/45 respectively. Economic data today comes in the form of the UK services PMI data and then the US non-manufacturing number later on this afternoon. Both figures are expected to decline slightly but remain above the 50.0 level, indicating expansion. Any surprise to the upside, like Tuesday's US manufacturing numbers, might see a test of recent highs in the shares spread betting markets. Between these numbers we get the ECB rate decision where little action is expected on either the interest rate or stimulus front. However, we might see a rather more bearish outlook from their statement, or at least some surprise at the weakness of recent Eurozone economic data. Yesterday's Eurozone manufacturing data tumbled to a level last seen in August 2009, raising fresh concerns about the European double dip recession. Those concerns were also heightened by a rise in German unemployment during April, triggering a nosedive in the EUR/USD forex market. The pair dropped 84 points to end the day at $1.3153. The single currency was on the offensive against the dollar before the US manufacturing data was released yesterday. However, it quickly reversed course to end marginally lower at $1.3235. Europe remains engulfed in sovereign debt troubles so the forex spread betting markets took notice of the potential downside over the short term. Developments in the Eurozone economies will probably be of crucial importance in the next few weeks. Friday's US Non Farm Payrolls number will also be on top of everyone's radar, but before then there's the ADP figure. This morning the euro is trading at $1.3185 against the US currency. Economic data will come in the form of manufacturing numbers from the UK and the US. Both of these figures are expected to decline but hold above the expansion level of 50.0. The PMI data has been stronger than expected on the whole so far in 2012, which is why predictions were that the UK would narrowly avoid a double dip recession. However, according to the ONS, that's not the case and our economy continues to flat line. With input prices stubbornly high and sterling on the up, other pressures are affecting manufacturers so the number might be lower than expected. 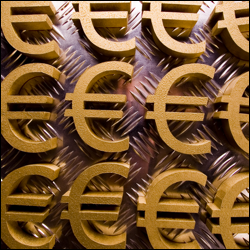 The EUR/USD pair closed rather flat yesterday, settling at $1.3240. This came as disappointing US economic figures were accompanied by the news that Spain has re-entered recession. This week sees European finance ministers meeting to talk about the new European wide banking rules. Consensus is unlikely to be reached this Wednesday, as growing disagreement from some member states, including the UK, is likely to push the discussions into the following month. In the FX spread betting markets, we saw the euro/US dollar pair rise to $1.3270, a level last seen on 3 April, with the session finishing 64 points up at $1.3252. On the surface, the single currency defied the odds as Spain's credit rating was downgraded and their unemployment level reached 24.4%, an 18 year high. Nevertheless, the lower than expected US GDP number might have convinced enough investors that QE3 is a possibility. This would suggest a more bearish outlook for the dollar on a relative basis.